This Roasted Garlic Burger with Cambozola is brought to you by the awesome Girl Carnivore (Kita) and the sponsors of the 2018 Burger Month. Thank you for supporting the brands that make this blog possible. All opinions, thoughts, and burger deliciousness are my own. This roasted garlic cambozola burger may seem unassuming, but this creamy gourmet cheeseburger boasts a sweet and tangy flavor perfect for your next cookout! 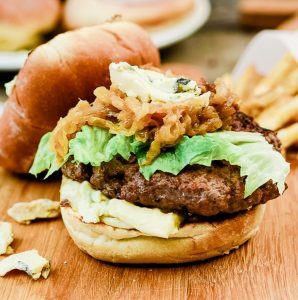 Whether you’re looking for a new burger for your upcoming cookout, Father’s Day, Fourth of July, or just a gourmet meal, this roasted garlic cambozola burger recipe has your covered! Serve it with a nice heirloom tomato salad and some rosemary fries for the ultimate combination of flavors! Perfectly Roasted Garlic Every Time. 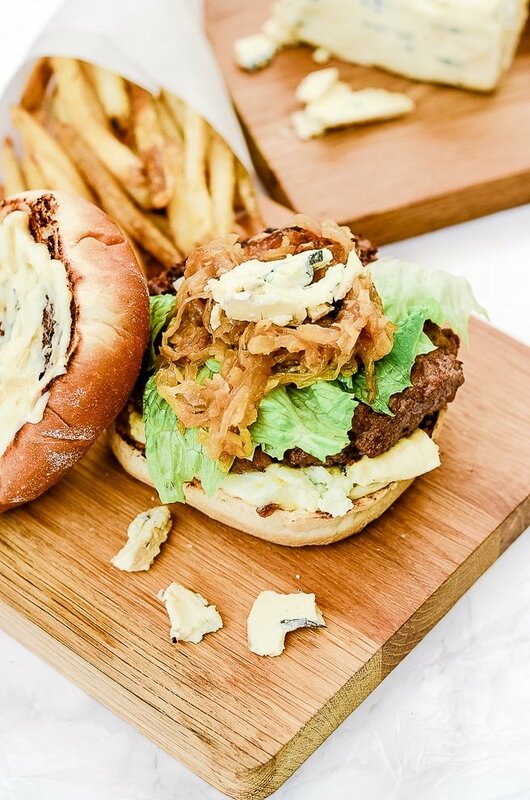 To make the sumptuous roasted garlic aioli that goes on this burger, you need to roast two heads of garlic. Find out how to get it perfectly cooked so it smashes easily and provides excellent flavor. Two Minute Homemade Mayonnaise. Everything tastes better homemade, so make the delicious roasted garlic aioli with homemade mayonnaise to knock it out of the park. How To Buy & Store Ground Beef. To for a superb burger, you need stellar ingredients. Find out what kind of ground beef will work best for this hamburger recipe and how to keep it fresh. How To Grill. Get the science behind the grilling method to make sure you get the exact right flavor on your burgers and cook it to your favorite doneness. Understanding USDA Food Labels. Not sure what kind of ground beef to buy? Get everything you need to know about the USDA labels to buy the right quality of ground beef for you. If you have any of this roasted garlic burger recipe leftover, you can store them in a single layer in a shallow, airtight dish. They will stay fresh in the refrigerator like this for up to five days, but the longer they sit the drier they will become. Make sure to keep the patties separate from the buns and toppings for best storage results. The roasted garlic aioli will stay fresh in the refrigerator for three days in an airtight container. Place a rack in the top third of your oven and preheat your oven’s broiler to high. Put the burgers in a single layer on a baking rack inside of a sheet pan lined with aluminum foil. The foil helps with easy cleanup. Place the burgers in the oven near the broiler and cook for 2-3 minutes. Remove the sheet pan, flip the burgers, return them to the oven and cook for another 2 minutes. Remove the burgers from the broiler, place on your buns with fresh toppings and serve. NOTE: I recommend using the broiler because, like grilling, the quick cooking of the outside help keep the inside juicy. Just a warning, consuming raw or undercooked meat may have consequences. The USDA recommended internal temperature for ground beef is 160°F for killing of any potentially harmful bacteria. If you cooked your burgers to less than this, your burgers run a risk of bacterial growth during refrigeration. If this concerns you, you can always crumble your leftovers and turn them into tacos, lasagna, or spaghetti meat. Reheating them this way will help ensure they are completely cooked through. This is one of my favorite food holiday months because it has so many options for celebrating! Burgers can vary so much that you could eat one every day and not repeat a flavor profile. To make burger month even more amazing, Kita at Girl Carnivore does this annual roundup of amazing burgers so you can actually try one every day. She even has this super rock awesome giveaway going on with an ultimate grilling package that includes a new Weber grill and lots of amazing goodies! Click the link HERE to enter, then scroll down to make today’s amazing roasted garlic burger recipe! Get your free printable grocery list for this Roasted Garlic Burger Recipe with Cambozola HERE. This grocery list has everything that you’ll need to make this roasted garlic burger recipe. To make grocery shopping simple, each ingredient is listed in easy-to-find grocery store amounts. If there is no amount specified, that means that you can buy the smallest (or largest) container available and still have plenty left over. 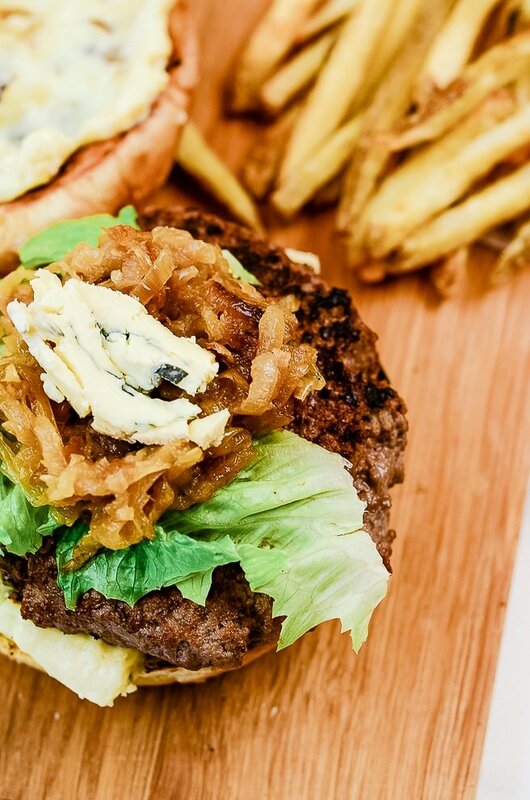 Break out of the rut of normal burger toppings and try this gourmet roasted garlic burger with cambozola. It's delightfully creamy and sweet with just a hint of tang. In a bowl, use the back of a spoon or a fork to smash the roasted garlic cloves into a paste (this works best if they are still hot or room temperature). Stir in the mayonnaise, season with salt and pepper and set aside. In a wide sauté pan, place the sliced onions and oil over medium-low heat. Stirring regularly, cook for 30 minutes or until the onions are deeply caramelized. Set aside. While the onions caramelize, gently work the Worcestershire sauce into the ground beef and form the beef into four 1/3 pound patties that are slightly wider than the buns you purchased. Generously sprinkle both sides of the patties with salt and pepper and set aside. Grill your burgers, flipping at least once, until the burger reaches your desired level of doneness, or an internal temperature 160°F. Remove from the grill and let rest for 5 minutes. While the burgers rest, toast the buns on the grill slightly then slather both halves with the roasted garlic aioli. Place the cambozola slices on the bottom bun and top with the burger, optional lettuce or arugula, caramelized onions and the top bun. Serve. When adding the Worcestershire sauce, be careful not to overwork the burgers. If you do, they will become tough when cooked. Make sure to put the cheese on the bun, not on the burger. Because the cambozola is so soft, it will melt right off of the burger if placed on top. Caramelised onions make the best! best! burger topping. I could not agree more! And I love that this recipe cures the issue of them making the burger slippery! This is SUCH a fabulous combination of toppings! Roasted garlic makes everything delicious. Love the tips you’ve provided for assembly and storage, too! Yes Yes Yes to the roasted garlic! I could put it on everything! Oh my YUM. This looks amazing – I love cambozola! Cambozola is such an under appreciated cheese! I love using it all the time! 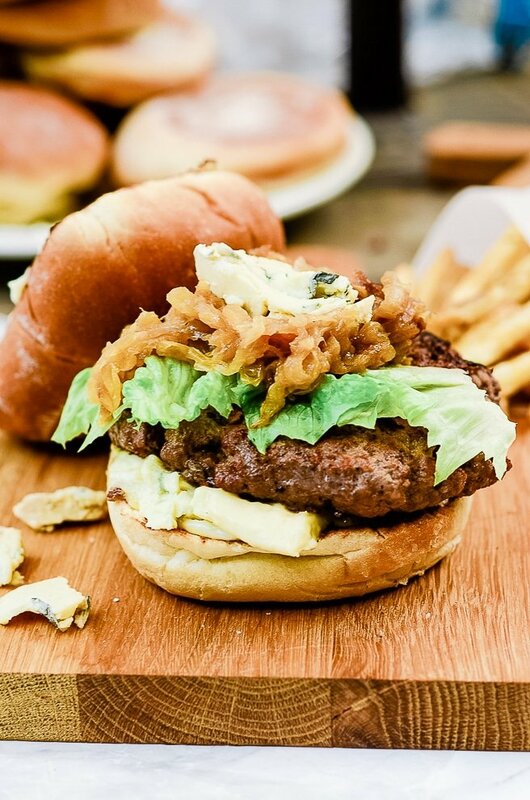 This burger is downright flavorful and delicious! I am in love with the garlic aioli and caramelized onions that I want to get grilling right now. It’s such a fantastic combo! The sweetness paired with the slightly sharp flavor of the cambozola makes for an epic dinner! I love roasted garlic, and adding it to my burger sounds heaven. This would make a perfect BBQ for our summer picnics. Saving this for later. Can’t wait to try. I love this burger at a cookout! It’s a nice change up from the typical cheeseburger! wow that’s such a good idea of a Burger recipe for Summer!Perfect to celebrate with this on so many occasions. It’s such a nice alternative to the traditional burger flavors used at a cookout. It’s always a big hit! I live in the Seattle area, so I’m always anxious for the rain to dissipate so I can start using my grill again. I feel you on being excited about summer! I hope you love the roasted garlic burger! Yay! I’m so excited that this is making it onto your Father’s Day menu! I hope he loves it! Well thanks for all the tips here! The burger looks super juicy, and the whole dish looks great! Thanks! It is such a delicious gourmet burger! This burger looks amazing! I’ve never heard of Cambozola. It sounds like it has a great flavor being a cross between brie and bleu. Great idea to add it to a burger! Oh Kim, once you try Cambozola, you’ll be hooked. It’s absolute cheese perfection! I would totally order this at a restaurant. It looks so good! I can’t wait to try it. Yes! I love that it’s a gourmet restaurant style recipe that is so easy to make at home! Oh my, this is a delicious sounding gourmet burger, I love roasted garlic and the cheese sounds amazing! Garlic and cheese are a combo I almost always love! What a great looking burger! Your photos are fabulous! Despite the fact that I just had dinner, I am imagining how great this would taste and planning to grab the ingredients this week to find out first hand! I’m so glad it’s going on your menu, Sara! It is an extremely delicious burger! I hope you love it, Edna! It is one of my favorite gourmet burgers to make at home.